'To be a king and wear a crown': Conversations on Kingship in the Letters of Elizabeth I and James VI. Please bring along your thoughts to contribute to the discussion from your own work and reading. Possibilities might include: philosophical understandings of memory; neo-Platonism; changes to collective memory wrought by reformation and renaissance; the art of memory; monuments and memorials; commemorations. Hugh HudsonAccommodating an Englishman in Early Renaissance Florence: The Evolution of the Hawkwood Monument in the Duomo. This meeting will be a round-table discussion on 'Words and Images'. How do words and images communicate meaning differently? How do their messages reinforce or contradict each other? What synergies exist in the use of words and images in early modern Europe? Charlotte Smith and Peter Sherlock will each speak briefly to early modern documents or objects that integrate words and images. You are encouraged to come along with your own examples of sources that make use of both words and images for discussion. 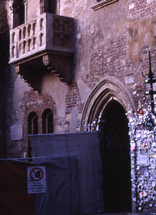 This paper looks at theatrical structures in the Baroque Gardens of Italy. It will trace the sources and emergence of these theatres in the late sixteenth century and look at the different ways in which theatre entered the baroque garden during the seventeenth and eighteenth centuries. The types of structures that fit into this discussion range from amphitheatres such as that at the Boboli gardens in Florence to the uniquely Italian topiary theatres that first appeared in Lucca in the 1650s. This will be round-table discussion on the theme 'Charisma' in the style of our earlier discussions on 'Memory' and 'Word and Image'. How should early modern historians think about the impact of individuals on history, especially the political, artistic, and military leaders who still dominate popular conceptions of the past? How can we assess the attributes of individual men and women, or identify the 'x-factor' which enabled them to exercise disproportionate influence and power in their society? Come along with an example of a figure from the early modern period and explain how he or she interacted with the world around them. In this talk I'll examine print representations of a number of monstrous births that could be described as demonic. These range from the 1512 monster of Ravenna to a seven-headed child born in 1573. I'll be considering why some monstrous births are able to be characterised as demonic while others are not, and how this might connect to a rising interest in the devil in sixteenth century German culture. I will discuss a painting from Henry VIII's art collection that was described as 'oone table with the pictures of the Frenche king, the Quene his wiff and the foole standing behind him'. This referred to a double-portrait of Francis I of France (reign 1515-47) and his second wife, Eleanor of Austria (1498-1558), which is currently held in storage at Hampton Court. In particular, I will explore the contextual history from the possible authorship and mysterious iconography to the socio-political function of this fascinating, yet rarely examined image.